Holiday travel accounts for thousands of accidents and injuries each year, some of which, unfortunately, lead to fatalities. So how can we prevent these accidents from happening and create safer driving conditions during the holidays? Keep reading to find out how to stay safe during the holiday season. Some of the reasons for the spike in accidents around the holidays include: an increase in traffic flow, drinking and driving, young drivers, and weather conditions. During the holiday’s, many people find themselves excited to reunite with friends and family and are in a hurry to reach their destination. Holiday seasons, no matter the time of year, see heavy increases in the amount of drivers on the road. Unfortunately, drinking and driving is also more prevalent as many people attend holiday parties and celebrations. Since most businesses are closed for Thanksgiving, the Wednesday before Thanksgiving has become one of the biggest drinking days of the year. There are more than 400 traffic fatalities between Blackout Wednesday and Black Friday, making Thanksgiving one of the most dangerous holidays for driving. Even more dangerous, though, is Independence Day. 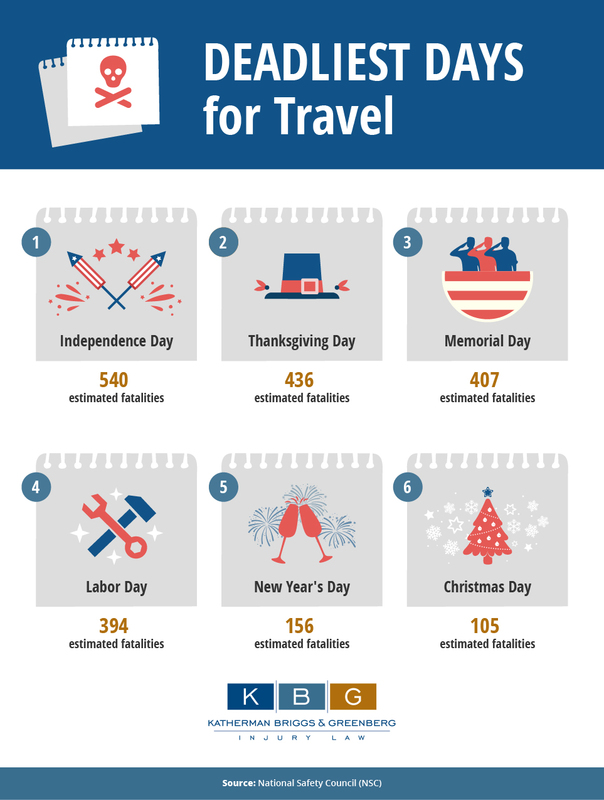 With over 500 deaths and 58,000 injuries in 2013, this holiday ranks #1 for most deadly holidays in the United States. Summer freedom and celebrations often mean alcohol is easily accessible and with more teen drivers on the road, driving on Independence Day can be hazardous! Depending on where you live, the holidays may mean additional planning for weather conditions. While many families will be able to avoid snowfall during Christmas and New Year’s, others are not as lucky. Snow, freezing rain and ice can cause delays and accidents during the holidays, especially as families are in a hurry to see their loved ones! Knowing the factors that contribute to unsafe driving conditions during the holidays makes you one step ahead of the game! Combining that knowledge with these helpful tips will ensure you are protected holiday season. Plan your travel to accommodate for extra traffic. This will give you peace of mind to help you to stay calm during your journey and prevent reckless driving behavior. Don’t drink and drive. This may seem self-explanatory, but think of how many lives could be saved (year round!) if everyone followed this simple rule! Your family and friends love you, just as other drivers are loved by their family and friends. Be proactive in ensuring DUI-related accidents and fatalities do not happen by encouraging your loved ones to spend the night or finding them a designated driver to help them get home safely if they’ve had a bit too much to drink. With apps like Uber and Lyft, finding a sober driver is always possible! You will feel better knowing that they are safe and the world will be a safer place because of you! Drive defensively. Since you can’t be sure everyone has a lot of driving experience, it is up to you to make sure you are following all traffic laws and being a defensive driver. Check the weather before you leave. Knowing what to expect from Mother Nature can help you reach your destination without delay and keep you from encountering bad weather during your travels. Use caution. Perhaps the most important tip is to be more cautious. While everyone is in a hurry to be with their family during the holidays, keep in mind that it is better to arrive late than to never arrive at all!